Welcome to my personal web page, which contains all sorts of things which intrigue and delight me, and which seem to me worth sharing and exhibiting. I hope that you enjoy your stay, and uncover something edifying. 2017 update: kindly check out ctLow Photography. Photography Basics - an essay on the essentials of photographic technique, both the Art and the Science of it. Written for beginners, but guaranteed to contain a new pearl or two of photographic wisdom for shutterbugs of all levels of experience. As of 2008 May, I have converted to sail! 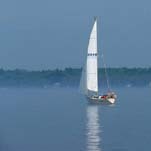 Having raced weekly on a friend's sailboat for quite a few years now, I made this decision largely and simply because I awoke, every morning for several months, dreaming of a sailboat. Here she is. Then: everything you wanted to know - and more - about my previous boat, Ksenia, purchased in 2001 June. It's a 1978 Trojan 26 Express - a thing of beauty and a joy to handle. Also, I am proud to be a member of and volunteer webmaster for the Brockville (Ontario, Canada) Power Squadron and member of the Brockville Yacht Club and the Thousand Islands Association. Privilege and Burden - why boaters should use other terms than "right-of-way"
Another volunteer WebMastership, this one for Film Brockville, bringing less widely-distributed movies to town! Specifically for Mac OS X 10.5 and later, this is one way (free but requiring some reading!) 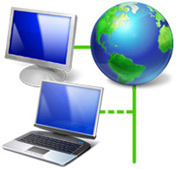 to connect two computers securely over the Internet, using SSH ("Secure Shell") to create a VPN ("Virtual Private Network"). This allows file sharing or screen sharing ("remote desktop"), among other things. VPN using SSH. Very cool! I have written two short essays, from the layman's perspective, on the fascinating grammatical construct of E-Prime. More accurately, I wrote one essay twice - once using E-Prime, which omits any use of the verb "to be", and once not. I am fond of "sayings," but these ones I have made up himself (or believe I have!) - most of them arising quite spontaneously in the course of conversation - but then recurring for years to come! ctLow's Aphorisms. Privacy: I collect no information other than a counter. Your visit here is completely private otherwise.